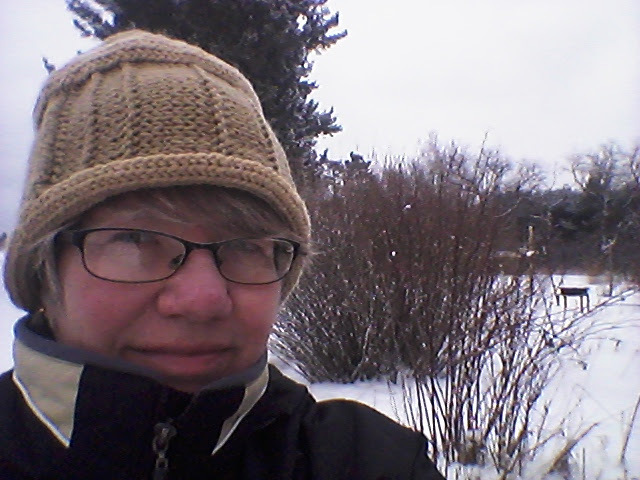 This hat started as a panel knit mostly in stockinette stitch in hit-and-miss colors from whatever yarn was within reach. If you look closely, you’ll see the rows don’t go around my head but up-and-down. I threw in some purl rows to give it some texture and vertical lines. If I’d really been planning to make a hat, I would have included a purl row to make a neat turn when I folded it. But I wasn’t and I didn’t. Instead, I went ahead and folded it so I have a double layer around my ears. Then I used cross-knit looping on the edge to give it a tidy finish. 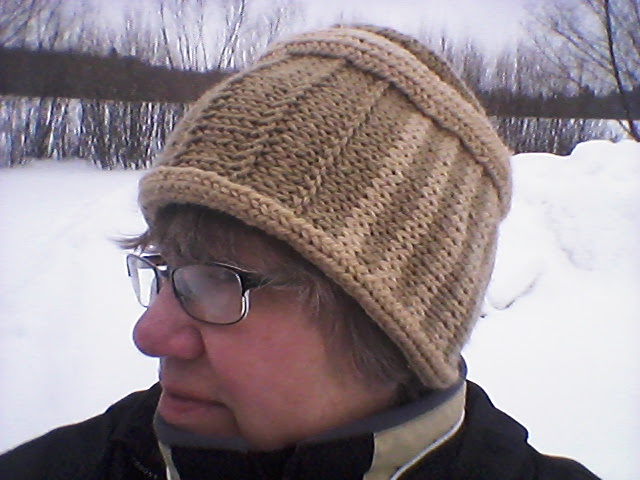 There are two other bands of cross-knit looping higher up, and cross-knit looping covers the seam where I sewed the panel into a hat. And the crown, which you can’t see in the selfie (my arms are not long enough), is Broden stitch nalbinding, worked after I seamed the panel together. I wanted to see how it would work to combine techniques. It worked, but the pick-up looked messy. You’ll have to take my word for it, because I covered up the messy bit with one of those bands of cross-knit looping. When I’m stitching for comfort, I don’t stop to take pictures. Last weekend I took some time to plan looping projects I want to work on over the next year. Or, to be more accurate, I made a list of things I want to make, prioritized by what I can learn from each project, pulled out a bin of yarns, sorted yarn into bags, matched project ideas to bags, crossed unmatched items off the list — and then started a small project that wasn’t even on the list. I wanted to practice a two-color variation on cross-knit looping, and my sorting had turned up two small balls of yarn that looked perfect for the challenge. My sorting also turned up the lucet I bought last June and forgot about. So I decided to make a bag that would hold the lucet and a little yarn to keep ready for traveling. I’ve spent too much time delayed in airports with my head full of aging parent worries to not have calming handwork already packed. And I suspect it’s more wounding to eternity to play solitaire on my phone than to make shoelaces or friendship bracelets to give away. Ack! Now that is a talent I aspire to (and have a long way to go). Just being able to pick up some yarn and start knitting and then fashion the result into a fantastic hat. Love it! I finally got a new Kindle and need to revisit your looping book. Clearly looping is incredibly useful. 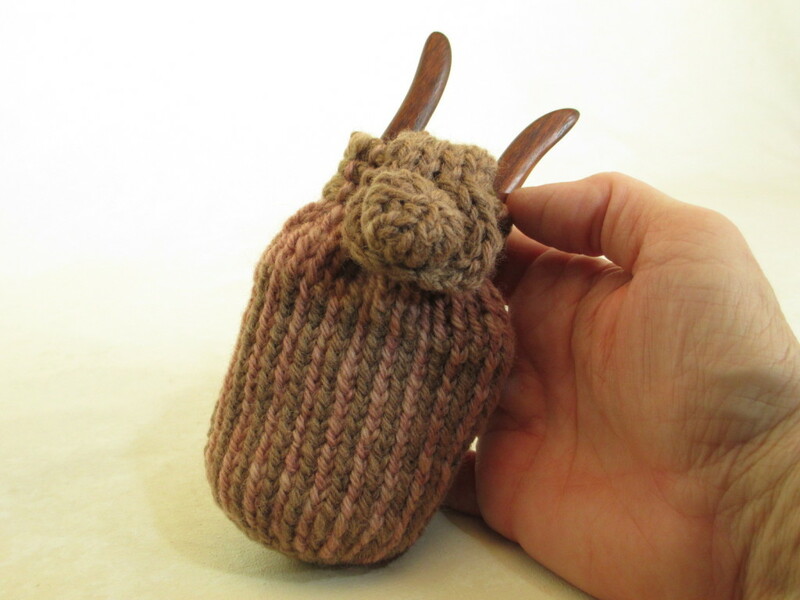 It’s good to have compensatory skills, since I’m notorious for going off pattern in knitting. And boy do I wish I could knit in the car like you do, Rebecca! So much fun to follow your fiber adventures, on and off the loom. Previous Previous post: How About A Meet-Up In Milwaukee?